SynThink sends quote with shipping / lead time and payment terms in 48hrs. Client pays the payments as per invoice. SynThink delivers the material with data / report to the client. NOTE: OUR EXISTING CLIENTS MAY REQUEST 30 DAY CREDIT PERIOD. Client places an Online Order with payment. 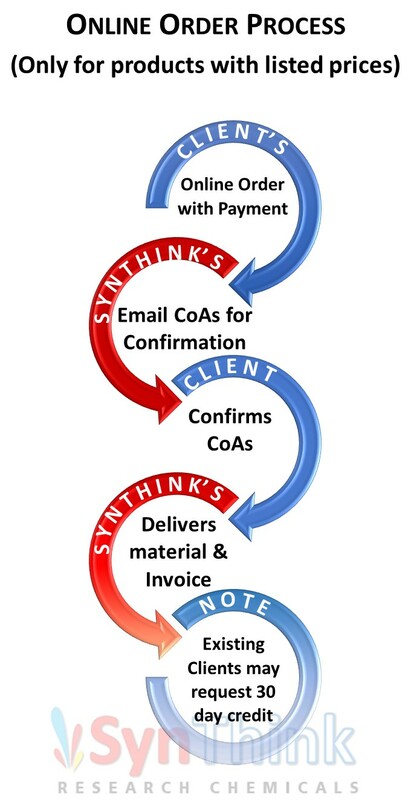 SynThink emails CoAs for confirmation. In case of enquiry client accepts of quote and sends a PURCHASE. We send data / report to the client. If feasible, we send a proposal with availability / lead time, quote and payment terms in 2-4 days. Custom synthesis of requested compounds starts at our R&D Lab. It may take 1-3 months. For longer project refer FTE model. The client will be informed periodically about the progress of the project. After completion of the project, we send data / report to the client. Once we get confirmation from the client we raise the invoice and ship the material. The client needs to pay according to terms and conditions given in proposal / quote. This model is most suitable for projects longer than 3 months. These projects are conducted under the terms of a proposal that delineates the level of effort required by experienced M.S. / Ph.D. scientists working full time on the project at the bench. These FTE (Full Time Equivalent) projects generally involve more complex or longer-term projects. Generally, the compounds being synthesized have not been described in any literature. Synthetic pathways to these compounds may need to be designed before being executed. This FTE approach allows our clients the flexibility to change goals and priorities on an immediate basis. FTE projects are generally invoiced monthly at a set FTE rate.